Welcome to Crystals in Chemistry, Part II. In this installment, we'll talk about how crystals are made and a few of the things that chemists and physicists use them for. For the previous installment, in which we covered some basics about what crystals are and how they form defects, click here. A few of Dr. David Chow's crystallization reactions in the Pecoraro lab. For puzzling out crystallization conditions, quantity equals quality. One of the most painstaking parts of being an inorganic chemist is crystallization. When it comes time in your research to crystallize a new compound so you can study its structure, that task becomes the dark beast lurking in your lab that you have to think about facing every day. Crystallizations are difficult because the conditions for growing high-quality crystals are not always obvious. Or, in the words of recent Ph. D. graduate David Chow, "You just try frickin' everything until something works." 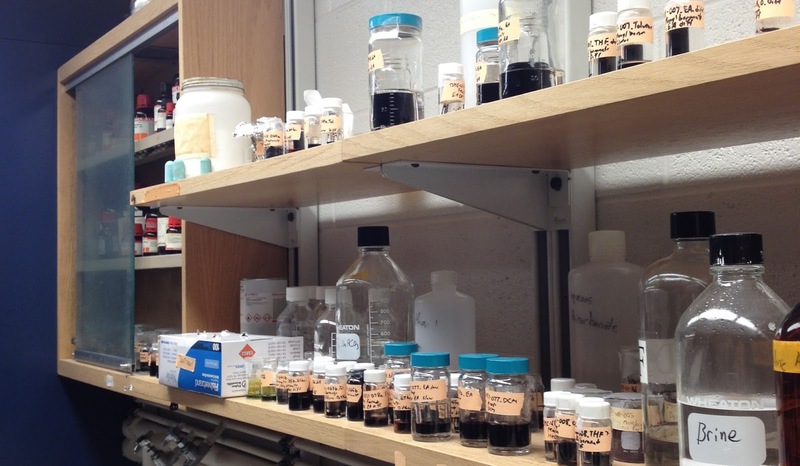 The picture above shows about half of the crystallizations he has running currently in his lab. When I asked how many different molecules he was working on, he said, "Really just one." It's not totally a shot in the dark, though. David has three solvents that he uses that typically work well with the materials he's interested in. Crystallization reactions can provide information even when they don't yield great crystals. "If you get powder [polycrystalline material] or crystals that aren't X-ray quality, you can just tweak the conditions a bit and then maybe it'll work." "And sometimes you just get lucky." Why all the work? In this segment, we'll go over how crystals form, why crystallizations are hard, and what chemists can do with crystals once they've got them. The magic word in crystal growth is nucleation. Nucleation refers to the event in which solute molecules stop floating around randomly in solution and decide to stick together to form the beginnings of a crystal. Most crystal growth techniques force nucleation by gradually changing the conditions that solute molecules experience. The goal is to create an environment where the more of the solute exists in solution than should be possible; this condition is called supersaturation. A supersaturated solution will respond by producing crystals. If crystallization happens slowly and the environment is not disturbed too much, a high-quality crystal is born. Well, sometimes. Nucleation is affected by lots of factors that are hard to control in practice, such as dust particles in the solution, microscopic (nanoscopic, really) irregularities in the glass container, temperature fluctuations, and vibrations from nearby movement. A recipe that gives a high-quality crystal once might not do so a second time, but might again the fifth time. Difficulties aside, how is supersaturation achieved? We'll run through three basic techniques in the next few paragraphs, using saline solution as an example. The simplest way to make salt crystals is to make a saturated salt solution, which has just enough water to dissolve the salt, and then remove some of the water by evaporation. All of a sudden, there's too much salt for the water that's left, and salt crystals will form from the excess salt. In practice, the rate of evaporation can be very important for crystal quality, and it can be controlled by crystallizing in a small vial with a tiny hole punched in the cap. With more holes, or larger ones, the evaporation rate will be faster. Salt crystals can also form when salt is dissolved in just enough hot water. For most solutes, the solubility goes up with temperature; most things are more soluble in hot solvents than in cold ones. Therefore, as the water cools down to room temperature, the salt becomes less soluble and might even become supersaturated, at which point crystals will form. Cooling the water even further (using an ice bath, for example) could help even more. Again, the cooling rate can be important to the crystal quality; for this reason, it's usually best to let the solution cool to room temperature before putting it in the freezer. For many inorganic solids, crystals are formed using heating and cooling, but the solvent is skipped. Scientists grow crystals of materials like silicon by melting down a bunch of polycrystalline material, then produce crystals from the melt by a number of different methods. You can see a time-lapse video of silicon crystal growth here, where a singly-crystalline ingot is pulled out of a vat of molten silicon over a period of 31 hours. of interest, and the clear layer is the "bad solvent." The last general way for making salt crystals is to reduce the solubility of the salt by changing the solvent. For our example, salt is very soluble in water ("good solvent") but not very soluble in alcohols ("bad solvent"). By allowing alcohol to slowly mix with the water, the salt solubility is gradually brought down, and supersaturation can be achieved. In practice, this is usually done one of two ways. In one method, the bad solvent is added to the good solvent containing the salt we want. The addition is done so slowly that the solvents don't actually mix, as shown at the left; instead, they form two separate phases and diffuse into one another over time. This method is called liquid-liquid diffusion, or "layering." In the second method, the good solvent and salt are placed in a small vial, which is then put inside of a larger chamber containing some bad solvent. The large chamber is then sealed such that the good and bad solvent don't mix, but they share the same atmosphere. Bad solvent will vaporize and then dissolve into the good solvent. The idea is the same as it is in layering, but this second vapor diffusion method is much slower. Once a crystal has nucleated, the hard part is over. The rest of the salt ions in solution still float around randomly, but once they hit the surface of the growing crystal they form strong bonds and are much more likely to stick than to dissolve back off. This brings us to the first application of crystallization: purification. Crystals are very precise geometric networks, and only molecules of the exact right size and shape can be incorporated. If you're crystallizing Compound A, molecules of Compound B aren't likely to fit into the crystal - like putting a square peg into a round hole. Instead, Compound B stays in solution and can be washed away. (This normally only works when you have lots of Compound A and not a lot of B, or when B is very soluble and A is not.) For a great explanation of this process, check out this University of Colorado Boulder website. Eureka! You've finally got your crystal. That's great! But now what do you do with it? Much of the time in chemistry labs, purification is the main goal. However, single crystals are very useful in a range of analytical methods. By performing measurements on single crystals, chemists can learn a lot about a compound's fundamental properties. The list is long and varied; here, we'll go through two common examples. One of the more powerful single crystal techniques is to determine a compound's molecular structure by shining a beam of X-rays on it and measuring how they bounce off. For organic molecules, there are simpler ways of deducing the structure. However, for some molecules, particularly inorganic complexes, techniques common to organic molecules can be ambiguous or impossible. The method is called X-ray diffraction, and its development led to multiple Nobel Prizes in Physics (1914 and 1915). In short, X-rays are fired at a crystal of the compound whose structure is to be determined. The angle at which the X-rays hit is varied, either by rotating the crystal or the X-ray source. The X-rays diffract off of the sample in ways that are characteristic of its structure at the atomic level. By measuring the angles at which X-rays are diffracted and processing the data (which can be very hard! ), the structure of the crystal can be determined. Plenty of chemists are working on developing new semiconductors or re-engineering old ones for practical applications like solar cells or converting sunlight into fuel. Many applications of semiconductors require them to be able to conduct electricity very effectively, so measurements of conductivity are important. But, as we mentioned last time, defects in the semiconductor like impurities and grain boundaries can dominate the conductivity. When we are evaluating a semiconductor for a particular application, we want to know the conductivity of the material itself, not the conductivity of the grain boundaries or of the impurities. The best way to do that is by performing the measurement on a highly pure single crystal. That doesn't mean, however, that impure crystals are useless. For example, silicon-based solar cells have had impurities added intentionally through a process called doping because pure silicon isn't very conductive. Polycrystalline materials are often more useful for technological applications than single crystals. For teasing out fundamental properties, though, you can't beat single crystal measurements. Crystallization challenges chemists in unique ways. In no other kind of experiment are a chemist's "hands" - how smoothly and calmly they can pipette solutions and move vials - so important. But, especially in inorganic chemistry and some areas of chemical biology, the data gained by studying single crystals is indispensable.